Chinese New Year celebrations are kicking off this weekend. It's hard to believe that Spring is just around the corner, with the cold nights getting colder and frost dusting our cars in the morning. However, there is light at the end of the tunnel, in the form of slightly longer days creeping in. It might not feel like it when you step outside, but Ireland's Imbolc traditional Gaelic festival celebrates the start of Spring. This weekend also sees the start of the Chinese New Year, welcoming the Year of the Pig. There are lots of different events celebrating both around Ireland and we've picked out a few as well as some other family days out. The weekend celebration at the Garden will weave together Brigit ritual, tradition, cross-making, creativity, and sharing to create a special Imbolc celebration that welcomes spring and the coming of Brigit. Events include Brigit's Day on Friday 1st, Brigit's Cross Making Workshop on Saturday and Brigit’s Day Seasonal Walk with Jenny Beale, founder of Brigit's Garden on Sunday. The annual festival of Irish music in the North West of Ireland, takes place from 27 January-10 February 2019 in Derry. The Imbolc International Music Festival programme features an eclectic mix of new music and intimate performances in inspiring locations – from churches, historic buildings to cafés and bars. During the weekend enjoy a photography exhibition, a food tasting table featuring local produce, talks with an herbalist, Senator Grace O'Sullivan and New Ross GYO group, a wishing tree Imbolc ceremony and family fun and entertainment, plus there will be Art workshops with resident artists Rose and lots more. Dublin Chinese New Year Festival returns from February 1st - 17th, celebrating the Year of the Pig. The festival includes talks, visual arts, performance, film, music, the popular spring fair and many family-friendly events, inviting all ages to be part of this cultural celebration. Composer Stuart Hancock conducts the RTÉ Concert Orchestra in his own score under a screening of We’re Going on a Bear Hunt! Five children and their dog go out to hunt a bear. They travel through grass, a river, mud, a forest and a snowstorm before coming face to face with a bear in its cave. Chaos ensues in a musical treat for all the family. Popular traditional music festival returns to Carlingford this weekend with workshops, sessions and performances from Caoimhín Ó Raghallaigh, Mary Bergin, Mick O Brien, Laoise Kelly, Éamon De Barra, Mairtín O Connor, Edel Fox, Mairead Ní Mhaonaigh, Cathal Hayden, Robbie Harris, Des Cafferkey, Edwina Guckian, John Mc Intyre and Zoe Conway. Hibernian Antique Fairs have been organising events around Ireland for 28 years. They host their annual Cork Antiques Fair on Sunday 3rd February in Clayton Silver Springs Hotel, with dealers from all over Ireland offering something for everyone. The DLR Winter of Heritage programme continues this month with free guided tours of Cabinteely House, James Joyce Tower, Marlay House and The Oratory. Dabbledoo Music makes music more accessible, engaging and fun for all the family. In this workshop on Saturday morning, children will be provided with instruments to play along with Igor The Octopus (the world’s greatest drummer! ), learn melody with Jazz Cat and even play an Irish Polka. Biddy's Day festival returns to Killorglin next weekend with lots of fun, entertaining events and the annual firelight procession. Join the The Speks on Sunday afternoon in the Riverbank Arts Centre in Newbridge with a lively show of nursery rhymes and sing-along songs set to acoustic Irish music which will have adults and kids jumping in their seats! The Speks music has been described as "Riverdance for kids" and they encourage everyone to sing, scream, clap and dance along during their performances. This will be a great, fun event for kids aged 2 to 92! 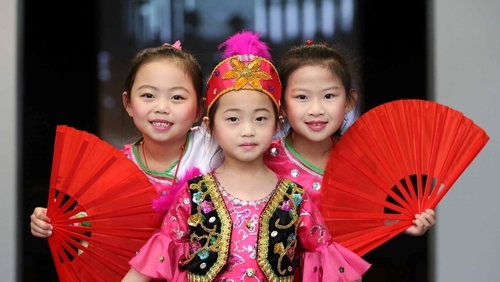 The hugely popular Spring Festival Fair returns to The CHQ Building on 8th & 9th,with a jam-packed two-day programme of free family-friendly entertainment as part of the Dublin Chinese New Year Festival. YouTube sensation Manny Man heads to Letterkenny next Friday and runs through Irish history from the Ice Age all the way to today, in less than 90 minutes of rip-roaring fun! When it comes to history, Manny Man is your only man! Next Saturday, February 9th, in the Solstice Arts Centre, children can create secret communication systems, discover intriguing concealment techniques and assemble their very own retro spy gadget. YourDaysOut is a sales and marketing platform for local businesses and event organisers with tools to help promote, publish and sell tickets and bookings online, for up to 50% less that other ticket sites.